23rd Annual Walk N Roll Community Pathway Celebration - This annual Monticello event draws huge crowds from Monticello and surrounding communities. New for 2018 ~ Face painting, balloon twisting and food trucks planned at Ellison Park in the new Lions Shelter! DirtWirx will have a mini mountain bike challenge course and demonstrations set up on the hill at East Bridge Park! Meet the new Monticello Arts Coordinator at East Bridge Park and get creative with "blinging out" your bike helmets! 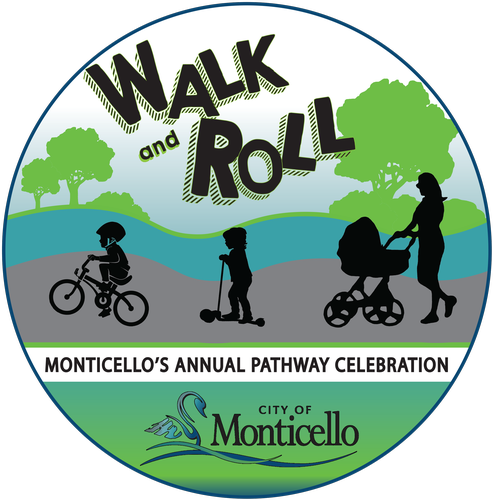 The City of Monticello and the Chamber of Commerce & Industry invite your organization or business to take part in the annual Walk 'N Roll celebration as a Pathway Partner. Walk 'N Roll is a chance for all residents to enjoy Monticello's beautiful parks and trail system. By registering as a Pathway Partner, you reserve a site along the Walk 'N Roll pathway route, so your organization or business will have a fabulous opportunity to promote your group to the entire community. For 2018, Walk 'N Roll and its Pathway Partners will be promoted through the direct mail and distribution of approximately 10,000 "pathports". The colorful pathport brochure will be mailed to all Monticello households, as well as select households in the Big Lake and Becker areas. Pathports will also be distributed at numerous other locations throughout Monticello. Pathports are the walk 'n roller guide to the Pathway on June 9th. Pathway activities take place from 9am - 1pm rain or shine. The route begins at CentraCare Health and continues to West Bridge Park. Pathway partners are located at various spots through Ellison Park, along River Street and conclude at West Bridge Park. As always there will be food and fun along the pathway from beginning to end. A voluntary contribution of $20.00 is requested to register your organization as a pathport partner to assist with the costs of holding the event. Thank you! You can hand out information about your organization, treats, or give away small promotional items (plan for around 1,000 participants). We do ask that you do not charge for items at your site. Many pathway partners volunteer to host a game or short activity at their site. Please register by May 4, 2018. Space is limited in the pathport, so please register early! Huge bike giveaway compliments of the business community. (Last year 36 bikes were given away during this event!) If you want to donate/purchase a bike please contact City Hall info@ci.monticello.mn.us or 763-295-2711. Prize drawings will be held at 12:00 pm in West Bridge Park, Rain or Shine! There is no cost to register for a site, but a voluntary contribution of $20.00 is encouraged to assist with the costs of promotion and entertainment. Thank you! Lunch Concessions available in West Bridge Park and the new Lions Shelter in Ellison Park.